JMS was competitively selected to design a new work barge for the Tennessee Valley Authority (TVA) to replace their existing barge. JMS has been contracted to provide structural and system designs to ABS rules, including contract drawings and equipment specifications. The primary purpose of the barge is buoy tending on the Tennessee River system. The barge will be 100′ x 30′ x 7′ and will incorporate special features specific to TVA’s operating requirements. These include an extended forward rake measuring 25 feet, which allows the barge to navigate closer to buoys in shallow waters. A section of the main deck is approximately one foot above the waterline, providing a working platform close to the water surface for buoy handling. Below deck, the barge will have a large storage area, generator room, two 5000 gallon fuel tanks, two 2500 gallon fresh water tanks and ballast tanks. 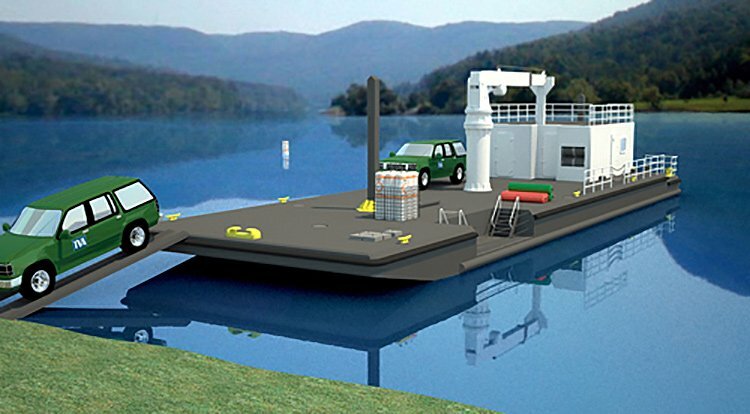 The barge will be capable of providing required electrical power through its 95kW generator. The barge can also connect to the pushboat to receive or provide power. Transfer pumps will be installed to move fuel and fresh water to the pushboat if necessary.